Hope was just sitting across from me in my office on a stool. She was asking me to sing to her. So as we went through a set list of songs including Jesus Loves Me, to Every Move I Make (I had grown a bit tired of I'm a Little Teapot recently) she gleefully listened and tried to do the hand motions. She is so full of words lately and was trying to express to me what she wanted next when these words came from my daughter's mouth. Its hard for me to express the impact those words had on me at that moment. They were said with such glee and joy, that the weight and truth of them nearly escaped me, but coming for the first time from the mouth of one so innocent, I was floored. Hope does need Jesus. What a responsibility that we have as parents to rightly communicate the saving love of Jesus to our children. I pray that Hope will always say those words with such joy and wreckless abandon...and I pray that she will say them with understanding at a young age. I'm speaking on the 6th chapter of Galatians this week at History. Its amazing to me as we have studied together this book, and as I am preparing to wrap up this series for Ben, the power of the simplicity of the gospel. It is something that to us as Christians is so familiar, but still moves us to a sense of wonder. I pray that I never lose familiarity or wonder at the truth of the saving love of Jesus Christ. This past friday some of the families in our small group put together a backyard outdoor movie night. It was an awesome time. It drew a bunch of Butch and Evelyn's neighbors (the hosts) and the majority of the 45 people who attended the word of mouth event, have never been a part of our church. It was great! The three families from History, ours, the Kruses, and the Milams had numerous opportunities to talk with these neighbors and begin to build some relationships. In ministry leadership we are always on the lookout for things that "work." Sometimes in that we start looking frantically at what everyone else is doing and try any and everything, usually wasting a great deal of time, energy and money. It struck me this weekend that this event went so well and was so easy because we were uniquely equipped to pull it off. History is a portable church right now so we have resources, gifts and equipment that are different from other churches. Our ability to do an event like this quickly and easily for what we pray will be a good return was different than other churches. I think Paul was up to something when he talked about each of us having gifts...I was reminded again with the importance of churches as well as individuals evaluating where their "capital" is. What are the ways that we as a community are uniquely gifted, and then run with those things. I really believe that God will bless that and we will see great success as a result. 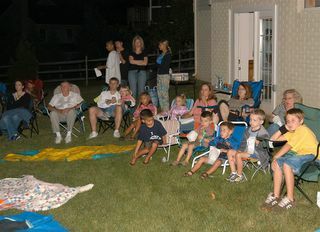 These are some of the families that attended our outdoor movie night. It was an amazing event! Nothing communicates the love of our heavenly Father like experiencing it for yourself! My life has been a bit nuts lately, hence the lack of blogging. As I've been running around like a chicken with my head cut off, I keep thinking of a couple I see on Sunday mornings as I pull up to the school to set up for church. They are an elderly Aisian couple...Chinese I think. As I pull up I am usually in rush, even though I am early and often the first one there, I feel a panick to get things going. Then I see this couple...walking...really slow....really SLOW. They are the slowest walkers I have ever seen. They are the antithesis of being in a hurry. One morning the Lord really nudged my heart as I watched them. There was such a contrast between myself and them. I don't know if they are even Christians, but I was filled with stress and hurriedness, and they were filled with peace, and I was coming to worship...something didn't fit. "Be still and know that I am God" I think that is one of the most difficult and one of the most important passages in Scripture, especially for those of us challenged and blessed to be in ministry. I need to learn to walk slow...really slow. My wife just started her blog. Reading it I was reminded of one of the things I find most beautiful about her. Her creativity and way with words is so stunning to me. Maybe I am biased...surely I am, but she does have a way with words. I think it is so beautiful. Its funny to find attraction in something like that...but really amazing too. I think about how our culture is so caught up with very shallow and physical beauty...we so quickly miss the wonder of what God intended. Its like chugging a bottle of fine red wine...stupid. My wife is stunning and beautiful physically, but when I see her shine in the ways that God has most gifted her, I am awed at the care of His handiwork in her. I'm getting ready to leave Va. Beach to head back to Reston. I came down yesterday as "reinforcements" for my mom, aunt, and grandfather who were holding down the fort at the hospital. Grandma is doing much better. They took her off the ventilator, and she was coherent and alert today when I left...Definitely on the upswing. The docs were talking about putting an internal defibulator in her heart...basically a shock machine that will go off if her heart goes out of rhythm...amazing! It was my grandparent's 61st wedding anniversary yesterday. As I watch my grandfather hold her hand as she was on the vent, I was reminded again at how much I have to learn from those who have gone before me. I want to have 61+ years of marriage...I want to be the man of prayer that my grandfather is. He walks every morning delivering newspapers in his retirement community and uses that time to pray for our whole family. I have no doubt that this family leans heavily on the prayer support of that man. Being young in ministry we push for innovation and figuring out what will best reach the next generation. It's good to slow down and remember some too though. I thank God for my grandparents. Again the spell check here on Blogger came up with an interesting suggestion. Instead of "blogger" it recommends, "flogger." I was listening to NPR (I am a die hard NPR junky...think what you may! )a couple of weeks ago and heard and interview with a songwriter. He made the comment that on his last album he started blogging. He found it to be a tremendous help when he found himself stuck lyrically. The discipline of simply creating sentences and coherent thoughts exercised his creativity in such a way that lyrics flowed much easier. I have such a passion for local churches creating new songs that reflect what God is doing in that local community. Over and over you hear the psalmists saying "sing to the Lord a new song." I'm hungry for a new song. My grandmother came down for my sister's wedding and while she was down here, her heart has stopped twice. 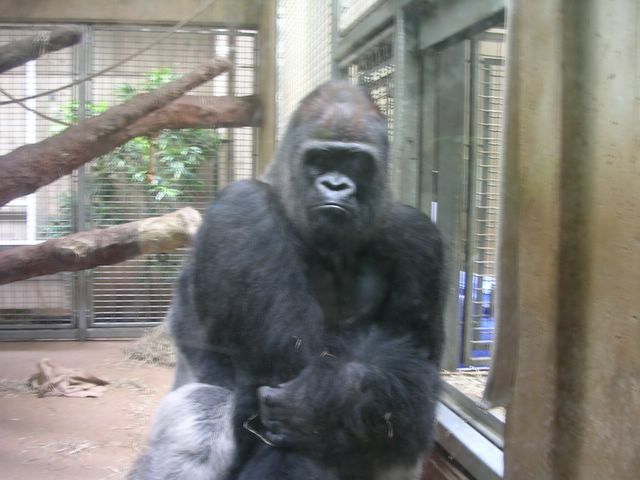 She is currently in ICU at Virginia Beach General Hospital. Please pray for her healing and for my family. I discovered something funny. The spell checker on blogger wants to change YHWH, the personal name of God in the OT. Something I expected...but the suggestion....Yahoo? What has been exciting to me is that I am learning so much about God in all of this. I guess that's typically the case when I prepare to speak, but I never cease to marvel at how God's word literally comes alive when we approach it with an open heart. Jeremiah 29:11-13 11 For I know the plans I have for you," declares the LORD, "plans to prosper you and not to harm you, plans to give you hope and a future. 12 Then you will call upon me and come and pray to me, and I will listen to you. 13 You will seek me and find me when you seek me with all your heart. The context here is a promise of liberation for Israel from exile in Babylon, the "hope and future" would definitely feel like a promise of something very tangible. But God is after something more, and so promises something more... "you will call...I will listen...you will seek and find." The promise of Jeremiah 29 is not just that God will meet our needs, but it is a promise of and invitation to intimate relationship with YHWH. That's where the real deal is found. This past weekend while camping with my buddies to celebrate my best friend's upcoming marriage to my sister we took a bit of time to lay hands on Heath and pray for him and for the marriage. 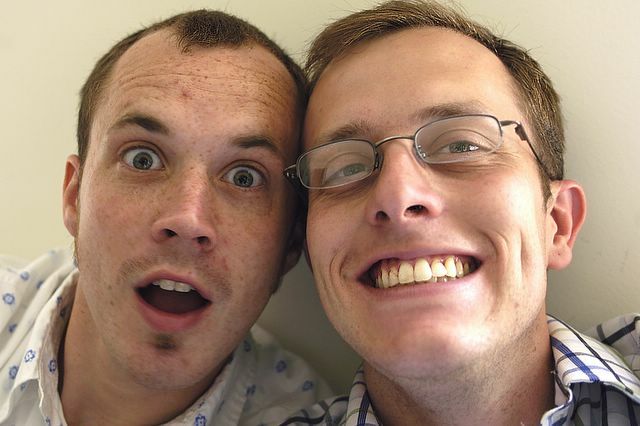 As we were praying I felt lead to pray for "whimsy" in their marriage...that it would be filled with fun and light heartedness. Afterwards he commented that it was funny that I prayed for whimsy...it is kinda funny...but at the same time it makes me want to pray for more whimsy in my marriage. When I got home I played blocks with my daughter...we made a castle. That's the best place of ministry! 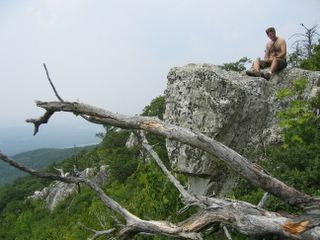 Picture of my buddy stu...I'm sitting on a similar outcropping...a great view...a fitting reward for a tough hike! I'm back from my trip. It was an amazing time with 3 of my best friends. One of the highlights of the trip was a 6 mile hike to the top of a mountain with amazing views. As you can imagine this was a hike frought with amazing analogies to our walk with Christ. Unfortunately my body hurts so bad that all I can think about is wishing I was in better shape. Do you solemly swear...blah blah blah...Congratulations....now how old are you? Being finally made official has got me thinking about my job as a minister. It is amazing. Its my job and my priviledge to be present in peoples greatest moments of transition. Birth, College, Marriage, Kids, Death. This is a call to be present in a very significant way in peoples lives at these crucial times. I think about how significantly I have been shaped by those seasons in my life...except for the death one...I haven't died yet. I also think about how much I have chaffed against God when those seasons have been difficult. Considering my call to coach and minister to other folks through that, perhaps I need to be very greatful for the struggles. Trouble is when I start getting greatful for struggles...feels like I am asking for more...crud..."I consider everything loss for the sake of knowing Christ..."
flying off the ol' stinky onion this week! Wow...really cool to see God at work!